The government has set a target of accepting 10,000 Vietnamese caregivers by the summer of 2020 to address a chronic labor shortage in the nursing sector, an official said Wednesday. Japan first aims to receive 3,000 Vietnamese carers within one year through an existing training program for foreigners, according to the official, who spoke on condition of anonymity. Due to the country’s rapidly graying population, the labor ministry estimates a need for an additional 550,000 caregivers in fiscal 2025 compared to the fiscal 2016 total. Vietnam is willing to send caregivers to Japan, and the two countries are expected to soon sign an agreement, the official said. Japan is also considering inviting caregivers from other countries, including Indonesia and Cambodia, the official said. As of March last year, there were roughly 1.9 million carers in Japan. The labor ministry estimates Japan will need about 2.45 million care workers in fiscal 2025, at which point the people belonging to the baby boomer generation born in the late 1940s will all be 75 years or older, meaning the need for nursing care service will almost certainly increase. A new Japanese law was enacted in November to add nursing care to the list of fields in which foreigners can work under the training program. Despite the change, Japan is struggling to secure caregivers from abroad as they are required to be able to speak enough Japanese to have a basic conversation and possess certain other qualifications. As of July, there were only two nursing care trainees under the government program, both from China. 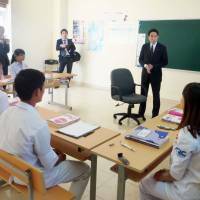 Japanese and Vietnamese officials have been holding talks on bilateral cooperation in the field of nursing care and agreed in June to put in place a system to enable more caregivers from the Southeast Asian country to work in Japan. One measure to be taken is to enable companies to pay for prospective employees to attend Japanese language schools before coming to Japan, instead of the trainees paying themselves. Twelve Japanese companies, which are able to take a total of 3,000 workers, have already been selected, according to the official. The training program for foreigners was introduced in 1993 with the aim of transferring skills to developing countries by training workers who would then return home. The government is now looking to allow them to stay more than five years, the current maximum for those trainees. Since fiscal 2008, Japan has also been accepting Indonesian, Filipino and Vietnamese caregivers under the economic partnership agreement. They can stay up to four years and have to pass a national exam to continue to stay and work in Japan. Japan accepted about 3,500 workers up until last fiscal year and 719 passed the exam, which can be hard as a certain level of skill in Japanese is required. Care facility operators are hoping that opening the door wider to overseas caregivers will be one solution for the labor shortage. Although more caregivers are desperately needed, it is hard to attract workers partly due to the relatively low wage paid. The government raised the monthly wage for care workers by ¥12,000 in 2015, but the average wage is ¥274,000 while the average for all industries is ¥409,000. Moreover, the shortage of workers is not just an issue for the nursing care field, but is now familiar to many industries. In a related development, Prime Minister Shinzo Abe said Tuesday that Japan aims to accept more foreign workers from April next year by creating a new residency status. To fill labor shortages not just in nursing care but also in other sectors including agriculture and manufacturing, the government has suggested it may begin admitting hundreds of thousands of blue-collar workers from abroad.